Dark Island reserve is a rich strong Orcadian Ale. After a gentle fermentation at the brewery in Quoyloo, the beer is finished in old oak casks formerly used to mature fine scotch malt whisky. This unhurried process creates a timeless classic full of fruit, spice, oak and roast malt flavours. Orkney Brewery, Quoyloo The tranquil Orkney Islands, with their fertile farming lands and fishing grounds, have been inhabited for over 5000 years. The Orkney brewery is housed in the former schoolhouse in Quoyloo, a mile from Skara Brae in the heart of Neolithic Orkney. 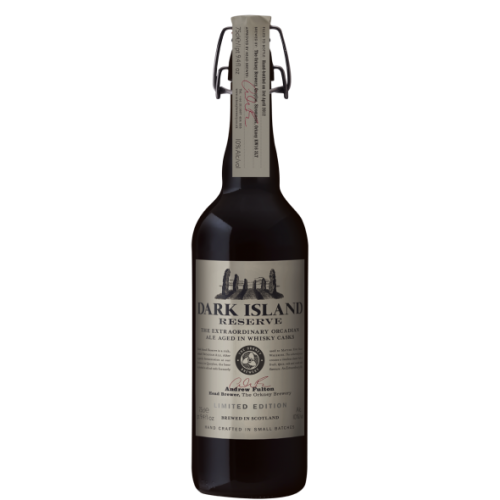 Dark Island reserve is a rich strong Orcadian Ale. After a gentle fermentation at the brewery in Quoyloo, the beer is finished in old oak casks formerly used to mature fine scotch malt whisky. This unhurried process creates a timeless classic full of fruit, spice, oak and roast malt flavours.